In the foreground are the Tristan Islanders, behind them the South Africans who volunteered to spend the first year on Marion. Allan Crawford is standing on the extreme right. ALLAN CRAWFORD, whom the Good Hope was carrying to Marion to take charge of the meteorological station and to become the island's first governor, was a remarkable man. He had left England in his early twenties in order to take up an appointment with the Iron and Steel Corporation at Pretoria. 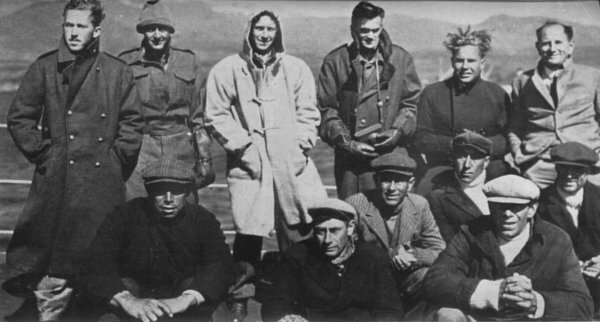 On the way out in the mailship he had met members of the Christoffersen Expedition, who were on their way from Norway to conduct a sociological and scientific survey of Tristan da Cunha and its inhabitants. He heard that they were looking for a surveyor to join them, and decided that there was more prospect of satisfying his urge for the unusual by going to Tristan than by joining a steel works. He knew nothing of surveying, but he persuaded Christoffersen that he could, and would, learn all that it was essential to know before the expedition left Cape Town. Christoffersen agreed to give him a chance. During the remainder of the voyage he thoroughly studied every book on surveying and related subjects that he could find aboard the ship. While waiting in Cape Town for the vessel that was to take the expedition to Tristan he continued his "cramming" with books borrowed from the public libraries. He knew enough by the time he reached Tristan to be able to make the first complete survey of the island ever carried out, his map being subsequently accepted by the British Admiralty as the official one. a century out of date. But their sincerity and simplicity appealed to the young Englishman. While he was there the British sloop Milford called on her way to Gough Island, where her captain had instructions to land a party and carry out a formal flag-raising ceremony in order to maintain Britain's long-standing claim to ownership of the island. Crawford secured permission to sail with her. Crawford and the other members of the Milford's landing party had a narrow escape when their boat was smashed to pieces on the rocks, and they finally had to swim to the rescue craft through heavy surf. He was pleased, howeyer, to have earned the distinction of being one of the very few people who have landed on this uninhabited and desolate island. On his return from Tristan he wrote a book about his adventures on the island. He called it I Went to Tristan. He volunteered for service after the outbreak of World War II and eventually found himself training to become a meteorologist in the South African Air Force. This brought him an opportunity, which he gladly took, to return to Tristan when the British Government in 1941 decided to establish a meteorological station there. His second visit lasted a year. My last memory of Crawford was of waving farewell to him from the quayside at Table Bay Harbour when the Good Hope carried him off to Tristan in 1946 for his third spell of duty there. He was to take charge of the meteorological station, and this time he was to spend two years on the island. members of the same expedition and that our next meeting would be not in Cape Town but way down in the "Roaring Forties." We spoke to each other over the radio telephone late that night after the Natal and Good Hope had met near Marion. Our ships were rolling and pitching heavily while the gale blew itself out. They steamed at reduced speed, waiting for daylight before attempting the passage between the islands. Crawford's voice came over the air as clearly as though he were speaking from the cabin next door. Briefly he told me how he came to be in on this job, and whom he had with him in his party. He told me also about his Tristan islanders and the boats they had brought with them. We led the Good Hope to an anchorage near the Gamtoos early the following day. The store-ship, now critically short of bunkers, was making a last desperate effort to get all her cargo out before starting homeward, Finlayson hoped, that evening. Soon after the Good Hope had anchored I boarded her with Dymond and Sara. Crawford greeted me warmly. Between frequent interruptions to attend conferences in the Captain's cabin and to deal with other matters concerned with disembarkation he told me the story of how he had come to accept leadership of this expedition, and how he had shepherded the Tristan islanders on their first venture into the outer world. Crawford chose middle-aged men from Tristan to accompany him because they were more experienced and skilful in handling boats than the younger unmarried ones. There were no bachelors available with the necessary qualifications. The men selected represented five of the island's six families. Arthur Rogers, who had helped Crawford to make his survey in 1937, was in charge of the party. The other members were Gordon Glass (Senior); Fred Swain; Edward Green; John Baptist Lavarello; and Arthur Repetto. Only the Hagans were not directly represented. The departure of these six men from the island was a matter of consequence to the entire community. All the 300 islanders trace their descent to half-a-dozen St. Helena women who were taken across to Tristan nearly a century and a half previously to marry shipwrecked survivors and some of Napoleon's guards, who had decided to settle there. They are thus all closely related by marriage. The community is really one big family. Their members have common loyalties and interests, and a deep affection for each other. They govern themselves under the guidance, when a suitable volunteer can be found, of a chaplain sent out by the Society for the Propagation of the Gospel in London. Crime, as the "civilised" world knows it, is non-existent, and they have no magistrates, policemen or prisons. They live the simplest of lives. "Work" means only fishing or tilling the soil for growing the potatoes which are their main diet. Until the meteorological staff came and brought radio with them, the islanders depended upon the ships that passed on an average of once a year for all their news of what was going on in the remainder of the world. They have never known alcohol and they know no disease. Even toothache is rare. The only illnesses they experience are common colds, which are invariably caught by the majority of the community each time a ship calls. Prior to the departure of Crawford's party some fifty years had elapsed since the last group of islanders had left their home. They had gone to South Africa to settle and none had returned. Since then only half a dozen had ventured out singly and in pairs, enticed away by the reported attractions of civilisation. Not all had come back. It was an unhappy day for Tristan, therefore, when the Good Hope sailed away with Crawford and his volunteers. There were no dry eyes even among the men, and for days there was gloom over the whole island. Tristanites introduced them to a new life altogether. It began when they saw the thousands of brightly painted houses plastering the mountain-sides for six miles from Camps Bay all the way into the city. What a contrast to their few score cottages which were built of grey stone and as low on the ground as possible in order to present the minimum surface to the furious gales so common there! In the harbour they were astonished at the number of vessels and the great size of some of them. They gazed in wonderment at the forest of tall cranes slinging cargo between ships and the shore. A few wives and sweethearts of the Good Hope's crew were waving welcomes from the quayside. As they drew nearer, the islanders stared and then nudged one another unobtrusively. Their attention was absorbed in the dress of the women. Used as they were only to the early Victorian fashions, they found bare arms, open necks and short skirts rather shocking. They never got used to this fashion, though they were too polite to criticise it or any of the other strange things that they found in civilisation. The islanders' first few minutes on shore were crowded with strange experiences. Having never seen a road or pavement, they walked warily along the concrete and tarmac. When they saw a motor-car coming towards them they turned to run. Their first car ride, at 30 m.p.h., left them shivering with fright. They had hitherto ridden only in boats and ships, and Shanks's pony's three to four miles an hour was the fastest speed that they were used to. They blinked at their first sight of a train moving along with great noise and speed. There was no lack of volunteers to drive them to the city. As they approached it they stared incredulously at the great buildings. Their number as well as their size astounded them. day. They devoted columns to the event. The people of Cape Town, thrilled to play hosts to such unusual visitors, lionised them. They enjoyed seeing their wonderment as they watched aircraft taking off and landing at Wingfield; their fascination at the sight of images moving in life-like manner on the cinema screen; their awe at being able to speak to each other over the telephone when separated by long distances, and their admiration of the beauty of the Peninsula's flower gardens. During those four days there was never a dull moment for the Tristan islanders. They turned up at the frigate only to sleep at night. One of those who entertained the visitors at his home at Camps Bay was Mr. "Bill" Lewis. He was planning to leave in a few days with the Pequena Fishery Survey Expedition. He invited the men to send back with him brief messages for their wives and their first impressions of this new world. He made a sound recording of their voices, and a few weeks later he played it back to the entire population of Tristan, gathered for the occasion on the village green. The island folk were moved beyond words with wonder and sentiment, and tears flowed freely as they asked that the record should be played to them again. A poignant feature of the recording was that it included a message from Arthur Repetto to his mother, septuagenarian Mrs. Francis Repetto, the unofficial "queen" of Tristan, who had been in heavy heart since the departure of her son, and; learning soon after of the passing of a childhood sweetheart in far-away Cape Town, had pined away and died a few days before the record was made. exile by radio from Cape Town. For technical reasons this proved impracticable, to the great disappointment of the men, who had been warned to listen for it. There were some other members of the Tristan party who did not have so pleasant a stay. They were the flock of geese that were being taken to Marion to provide eggs and fowl flesh for the permanent staff. At home they were used to an air temperature that seldom exceeded 60 degrees Fahrenheit. They arrived in Cape Town in the middle of its worst heat-wave for many years. The shade temperature reached 104 degrees, and two of the geese died of heatstroke. The surviving geese were as exhausted as the men from Tristan when the Good Hope set off southward again. Five days later they were shivering again in Marion's noon-day temperature of about 45 degrees.